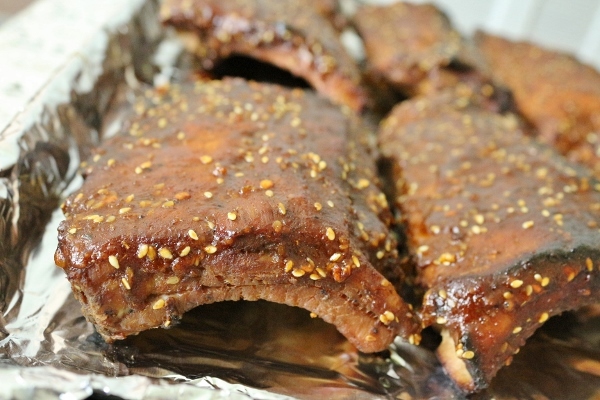 These are some of my favorite ribs. 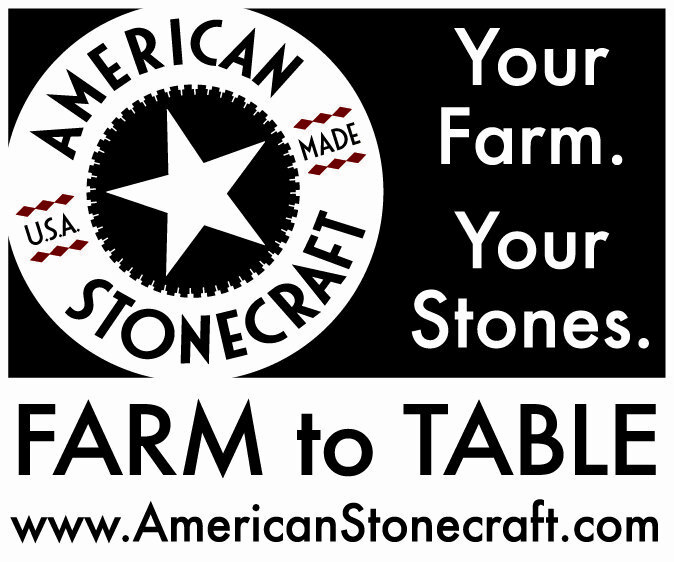 I've made them for guests on many occasions over the years and they have always met rave reviews. And I have a secret for you. They aren't even grilled! They are super easy to make year-round because you actually prepare them in the oven. Broiling the ribs first gives the ribs some great color and texture. Then placing the ribs on a rack over a small pool of water in a roasting pan actually allows them to stay super moist during the slow cooking process. By the end of a couple hours, your ribs are practically falling off the bone (and if you overcook them, they will LITERALLY fall off the bone). The cooking method is great, but there is more to these easy-to-make ribs that makes them so popular. The marinade/sauce is Asian influenced; the original recipe derives from Alan Wong's Restaurant in Honolulu, Hawaii by way of a McCall's Magazine article many many years ago (May 2000 to be exact). I've been making these ribs since then, and I will continue to do so for many more to come. 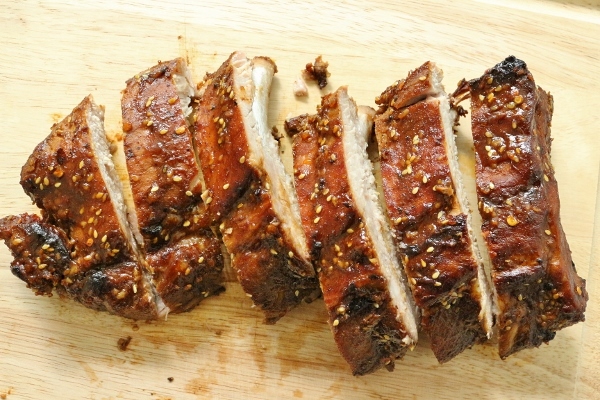 I've adapted these ribs a bit from the original. The sauce is almost identical, but I've simplified the cooking method a bit. 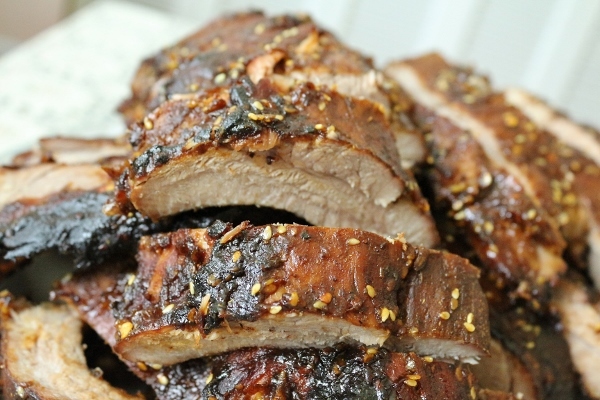 The sauce is truly what makes these ribs shine. It includes a pretty long list of ingredients, but many of them can be found in any avid cook's pantry. You could easily use this sauce on grilled ribs too, but the results from this technique are just perfect for me. For many years I have hesitated to share this recipe. It may not be an original, but I've made it my own. I'm finally ready to part with the secret, and here is that coveted recipe... You're welcome! Whisk together all the ingredients except for the ribs, salt, and pepper. Reserve 1 1/2 cups of the sauce (a bit less than half) and refrigerate until needed. 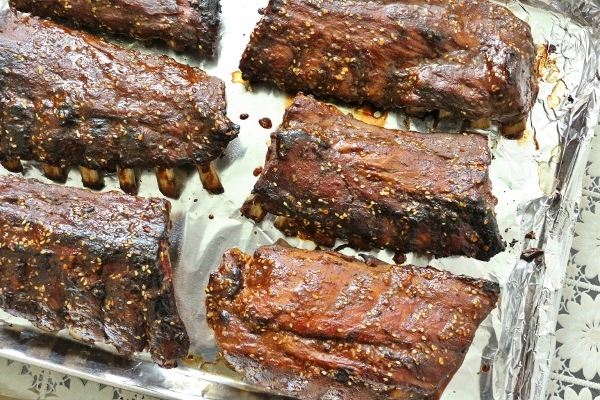 Place ribs in a large Tupperware or food storage bag and add the remaining sauce. Cover and refrigerate the ribs overnight to marinate. Preheat broiler. In a roasting pan, place a roasting rack large enough to fit it. Wipe off excess marinade, season ribs with salt and pepper, and place the ribs bone-side up on the rack and broil for 10 to 15 minutes until lightly browned. Flip over the ribs so the meat-side is up and broil another 10 to 15 minutes. Remove the roasting pan from the oven and fill about 1/4 inch of water, enough to almost reach the bottom of the rack. Heat the oven to 375 degrees F. Cover the pan with foil and bake for 1 1/2 to 2 hours, or until the meat between the ribs is fork-tender. Remove the pan from the oven, remove the foil and brush with 3/4 cup of the reserved sauce (alternatively, you can make the ribs up to this point in advance, remove them to a sheet pan, and then brush on the sauce and return to the oven to re-heat and finish them off when you're ready to serve). Return to the oven uncovered and bake for another 15 minutes. Heat the remaining 3/4 cup sauce to serve alongside the ribs. 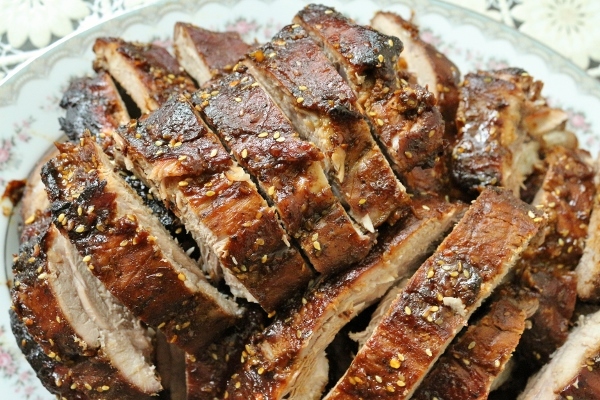 Cut racks into individual ribs using a serrated knife, transfer to a platter, and serve with the warmed sauce. 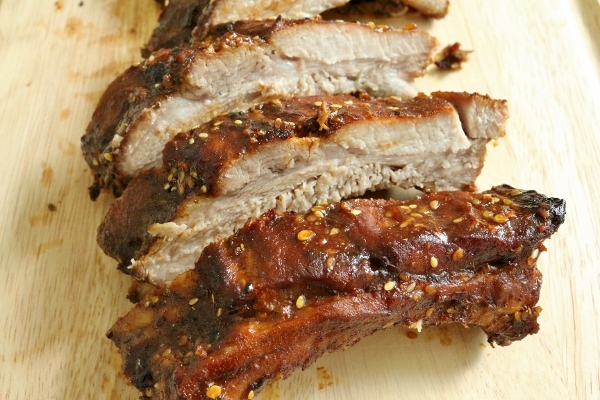 *Note* The original recipe uses the same amount of marinade/sauce for 2 racks of ribs, but I think it's plenty for 3. 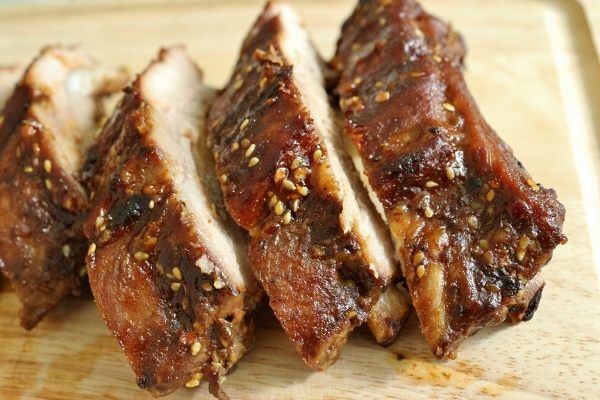 If you want, you can easily cut down the recipe to 2 racks and use the same amount of sauce. You'll just have a more generous amount of marinade. Brussels Sprouts and Bacon Dumplings + GIVEAWAY!